Nazareth House Apostolate Blog: The Students of Nazareth House Apostolate School, Kabala Sierra Leone thanks you! 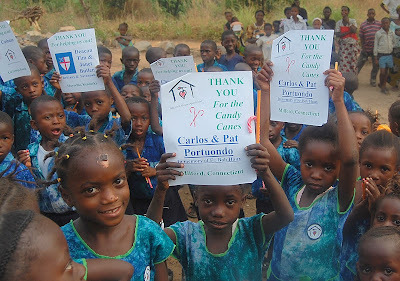 The Students of Nazareth House Apostolate School, Kabala Sierra Leone thanks you! There is no need for words, James' photo of the child centered above says it all! Such joy, such excitement. The candy canes are a small part of the joy these children are experiencing. Less than one year ago, these students had no school building, it was in the construction process. One year ago these students were meeting outside, under trees to receive an education. Today these children dressed in fashionable new uniforms attend school daily in a brand new school building. All because so many of you saw the need and gave of yourself & your resources to see the project come to life. Through Nazareth House your desire to help children has been made a reality.